Since 2000, WAVE Foundation has supported the Ohio River Valley Sanation Commission (ORSANCO) annual River Sweep program in an effort to promote water quality awareness. The Ohio River Sweep is a volunteer riverbank cleanup that extends the entire length of the Ohio River. Volunteers from the six states, which border the Ohio River, will remove litter at multiple locations along the Ohio River and many of its tributaries. 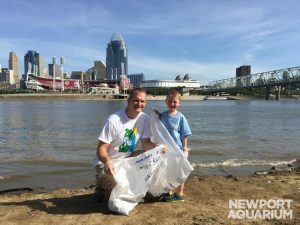 The Ohio River Sweep is a family-friendly event and convenient for young people, families and community organizations. Join WAVE staff and volunteers in this community effort, and become a River Sweep volunteer! To volunteer at the Newport Aquarium location, please register at: https://www.allforgood.org/projects/78evEqJp. All volunteers must register online and fill out a waiver at check-in. All volunteers under 18 must have a guardian present. Special River Sweep t-shirts and pizza will be provided for volunteers! 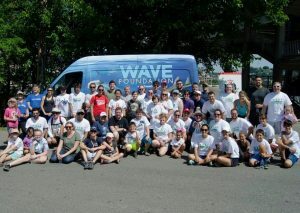 In 2018, more than 90 WAVE volunteers and staff of all ages participated in the one-day cleanup. In this one-day alone, over 150 pounds of trash and other debris were collected from the banks of the Ohio River and all its tributaries. We collected 80 pounds of recyclable goods! Plastics: 70% Glass/Aluminum: 25% Fishing Line: 5% All recyclables were sent to “Close the Loop,” a company that converts recyclables into useable goods.